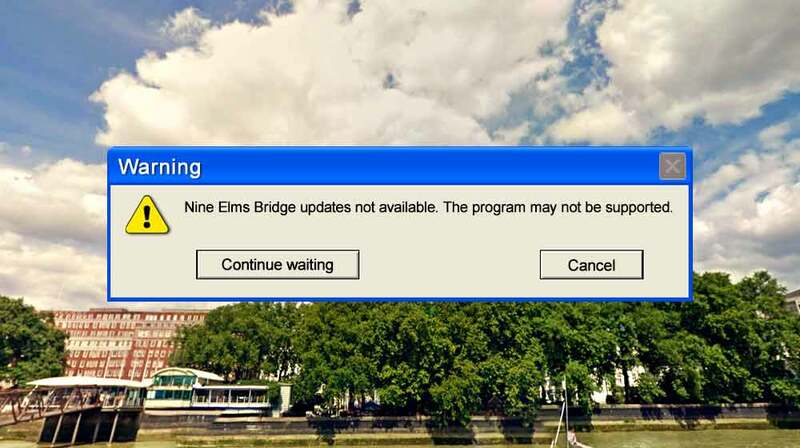 Wandsworth’s Nine Elms Cycle Bridge PR, strategists and lobbyists sent invites for a get-together aimed at reaching out to us folks North of the River to tell us about the work they have been doing over the last two years since Bystrup won the competition. The meeting was billed as a consultation exercise for the NEPB team to provide technical updates, answer questions and receive feedback. Developers need to show a list of public consultations and although these events are often box-ticking exercises, they can sometimes be helpful, so we all went along to DP9’s expansive office on Pall Mall to find out the latest. There were preambles, overviews and graphics. We were reminded of the health benefits for cyclists and pedestrians if they diverted from their usual routes. And they explained, yet again, how the £40 million wonder cycle bridge would let us to pop over to the new Waitrose in Battersea. Now, about that £40m. The figure surfaced around 2013-14 but the team would never tell us how it was calculated. So we asked again. Apparently it’s just a number that was floated and seems to have stuck over the years without ever being re-examined. The £26m ‘private funding’ contribution often mentioned is earmarked from CIL and s106 payments from the Nine Elms Development. So, what’s the current estimate? Answer: No info on costs. We asked about integration of the cycle bridge into local and city-wide traffic infrastructure, including the new Cycle Superhighways and the new Tube extension to Battersea Power Station. The team thought that cyclists and pedestrians would definitely need some sort of crossing over increasingly congested Grosvenor Road but could then use whatever Pimlico streets were most convenient to them for their onward journeys. All 18,000 trips per day. Answer: No plans to integrate the bridge with London. We wanted to see the cost-benefits and impact studies of the nine possible locations including the new ones. Without analysis of the real-World consequences they’re just lines on a map. Answer: Sorry, no info on benefits or impact studies. 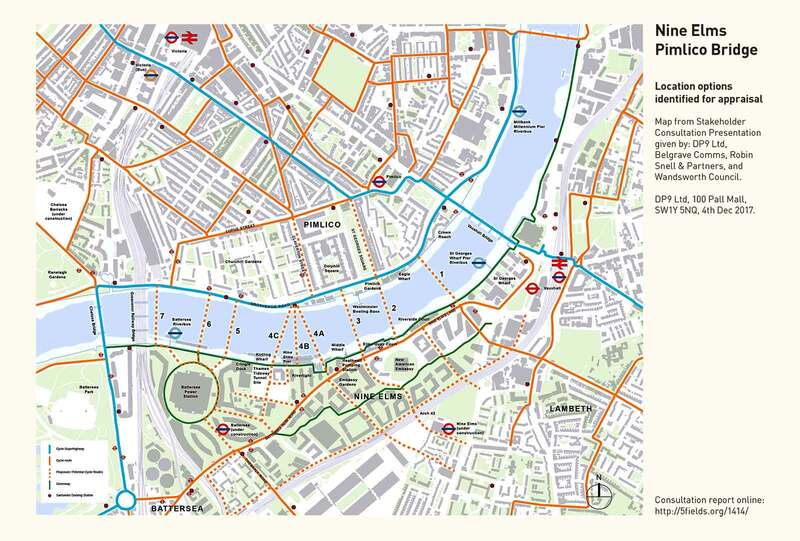 Could the team at least show that there was a case for a cycle bridge route between the brand new residential apartments in Nine Elms and the old ones in Pimlico? Answer: Um, trying to find one right now. No new technical, transport, financial, impact or viability updates were provided, no important questions answered. We got a cup of coffee and a look at DP9’s £900k interior refurb (nicely done, bit soulless) but nothing else. The team did ask for our assessment of the bridge location options, but since they couldn’t offer details on any of them, none of us were able to comment. The meeting was as insubstantial as the bridge and really shouldn’t count as a consultation. The organisers told us that the missing technical updates and additional modelling data would be made available to us by the end of 2017. I’ve asked for the reports and will publish if they respond. *See below. Credit to architect Robin Snell for trying to inject a little inspiration into the reality-free zone that this project has become. Wandsworth Council leader Ravi Govindia should consider running these events with a bit more authority and substance or to stop pretending that the cycle bridge has anything to offer Londoners. * Belgrave Property PR have responded: Looks like there are no technical updates, studies or reports. They’ve said they will be made available when work has progressed sufficiently to warrant it. They sent the consultation presentation PDF which was used at the meeting. You can view and download a text version in Word doc format. The full PDF is mainly large images and graphics so it’s 50Mb but if you want it all, here it is. From the presentation is this map which shows the proposed locations. The American Embassy to Pimlico Gardens alignment still seems to be favoured but more options have been added; a map will be posted when I get the promised updates. If you’re not already subscribed, get notified by email here. Do you have any specific questions for the Bridge team or Wandsworth Council? Use the comments below, or send a message, and I’ll try to get them answered. I’d like to thank our hosts, DP9, for their hospitality, and the bridge team for putting up with our exasperated questioning on a cold and dark December evening. Let’s hope there’s something meaty next time! NEPB Consultation at DP9 Ltd, 100 Pall Mall, SW1Y 5NQ, 4th Dec 2017 at 6pm. NEP Bridge team: DP9 Ltd (Planning consultants); Nick Dines, Belgrave Property PR; Robin Snell, Robin Snell & Partners (Architects); Wandsworth Council. Competition winner Bystrup didn’t attend. Attendees: Councillor Angela Harvey, WCC; Edward Reeve, Pimlico FREDA; Ken Sparkes, Warwick Sq; Jeffrey Fearnside, Dolphin Square BDTA ; Peter Ruback, Pimlico Neighbourhood Forum. Pimlico residents may remember that DP9 and Belgrave Comms were involved with the ill-fated Mosaic/Gravita development at 84 Eccleston Square. Westminster City Council have consistently rejected the case for the bridge since its inception in 2102, and a 2016 scrutiny committee found the project to be flawed. The Mayor of London, Sadiq Khan, has confirmed that the project could not proceed without Westminster’s backing although he has included the bridge in the latest transport section of the Draft London Plan. Separator image Posted in Planning and tagged with bridge, cycle, nine elms.